Earnings were on the higher end of analyst expectations. This competition has cut into the company’s market share over the past several years, pushing its shares into sub-$1 territory and forcing it to issue several “going concern” statements in its 2016 earnings reports. Jeffrey Osborne, analyst for Cowen & Co., cited several positive signs in Enphase’s first quarter report, including its improved gross margins “driven primarily by stable pricing, supply chain optimization, and the transition of the IQ 7 platform,” Enphase’s latest technology. 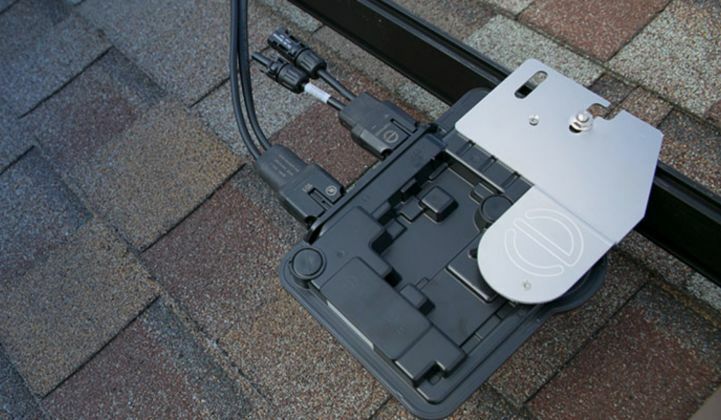 Enphase shipped 611,000 microinverters, or 180 megawatts-DC, about 67 percent of those being its IQ technology. The IQ 7 started rolling out in the U.S. this quarter, and represented about 8 percent its shipments in the first quarter, Kothandaraman said. In the Asia-Pacific region, revenue increased 5 percent from the previous quarter and 88 percent year-over-year, marking Enphase’s largest quarter ever for shipments to the region, he said. Other key markets include India, where Enphase recently announced availability of its IQ microinverters, and Latin America, where first-quarter revenue increased about 32 percent from the previous quarter, driven by investment into rebuilding Puerto Rico’s energy infrastructure. Kothandaraman conceded that component shortages have hampered the IQ 7 rollout, adding, “We are working diligently to resolve the issue.” But the company estimates that the product could open a “gigawatt of new market opportunity,” he said, representing a roughly 20 percent increase to its served available market.